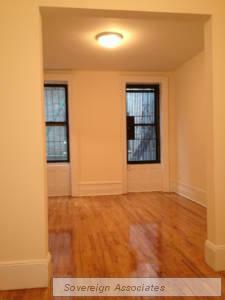 West 108th & B'Way two bedrooms for January 15. Kitchen and bathroom has been completely renovated. Nice Hardwood floors in all rooms. Window in bathroom. Plenty of natural light. Both bedrooms with closets. Second floor in a walk up. Less than a five minute walk to Columbia University or Barnard. It is only 5 to 10 minute walk to the university. Within the area is St. John's the divine, Columbia University, Barnard College, Manhattan School of Music, Central Park, Riverside Park, fine restaurants, cafes, outside eateries, trendy bars, and specialty stores. Transportation is very good with subway line on 103rd St. and 110th St. stations (1/b/c) on Broadway/Central Park West and bus stations. Listing courtesy of Sovereign Associates Inc.